Process engineers in search of a flow measurement solution to support accurate, safe and economical nitrogen tank blanketing operations will find the ST Series Family of Flow Meters from Fluid Components International (FCI) provides a wide range of choices designed to accommodate various tank and line sizes. Storage tank blanketing or padding by pumping inert nitrogen or other gases into the vapor space of a tank is designed to protect the contents. Depending on the specific type of product stored in the tank, blanketing can prevent contamination, toxic fume leaks, explosions or fires. The pressure of the blanketing gas pumped into the tank is slightly higher than atmospheric pressure, which is all that is necessary to achieve the desired results. Accurately measuring the blanketing gas is important because adding too much gas is unsafe, wasteful and expensive. Most storage tanks are not generally designed for high pressure environments—so over-pressurization can be a dangerous issue. Installing an ST Series Flow Meter upstream from a tank’s regulator valve allows the monitoring and control of the nitrogen flow rate. FCI’s mass flow meters are calibrated to specific gases such as nitrogen for superior accuracy in FCI’s NIST-approved Calibration Laboratory. Their thermal dispersion mass flow sensors and rugged packaging are suitable for a wide range of industrial process environments. The ST100 Series Flow Meter is ideal for mass flow measurement of nitrogen gas in tank blanketing processes. Communication options include 4-20 mA analog, frequency/pulse, or certified digital bus communications such as HART, Foundation Fieldbus, Profibus PA or Modbus RS485. 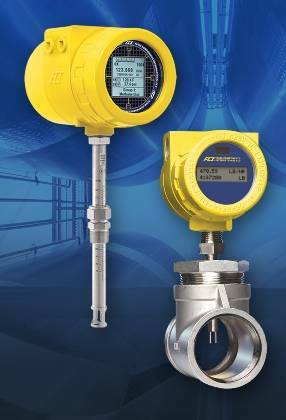 For ease of view, the ST100 Flow Meter features a graphical, multivariable, backlit LCD display/readout. It provides local information with a continuous display of all process measurements and alarm status, as well as service diagnostics. Designed for accurate air/gas measurement, the ST100 Flow Meter stores up to five calibration groups to support a broad flow range, differing same gas mixtures, multiple gases, with a range of flow far in excess of 100:1. An on-board data logger is included with a removable 2-GB micro-SD memory card to store process flow data. The ST100 can be factory calibrated for air, nitrogen or virtually any other process gas. The insertion style air/gas meter features a thermal flow sensing element that measures flow from 0.07 NMPS to 305 NMPS with accuracy of ±0.75 percent of reading, ±0.5 percent of full scale. Designed for rugged industrial applications, the ST100 Flow Meter operates at up to 454ºC and is available with both integral and remote 300 meters electronics versions. The entire instrument is agency approved for hazardous environments. The enclosure is NEMA 4X/IP67 rated. Approvals include SIL-1, ATEX, IECEx, FM and FMc. For the small tanks and line sizes required by specialized processes, the ST75 Flow Meter is an accurate, no moving parts, direct mass flow measurement and monitoring solution. It is ideal for measuring nitrogen tank blanketing, as well as measuring compressed air, fuel gases and other gas flows within industrial processes. Offering a rich set of features, the ST75 Flow Meter supports small line sizes ranging from 6 to 51 millimeters. The ST75 meter provides three unique outputs: the mass flow rate, totalized flow and media temperature. With built-in temperature compensation, the ST75 meter maintains consistent performance in rugged environments with accuracy to ±2% of reading with ±0.5% repeatability over varying temperatures. It is well suited for low flow and high flow operations over a wide flow range, from 0.01 to 950 NCMH depending on line size. For variable process conditions, the ST75 is factory preset to a wide turndown range at 10:1 to 100:1.